The official flat rate from Orly to the city center is €30 (Left Bank) or €35 (Right Bank). Tipping is optional but customary; a few euros should be adequate. Driving time can be anywhere from 30 to 90 minutes, depending on traffic. 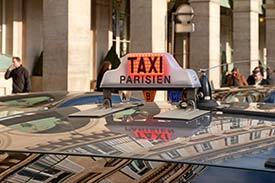 See our Paris Taxis article for more advice on traveling by cab. Paris Airport Shuttle will take you to or from your hotel in central Paris for 17 to 40 euros per person (depending on the number of travelers in your party) with a €3 surcharge for trips early in the morning or at night. Transportation is in shared seven-passenger vans. Book online at least 24 hours in advance, and you'll receive a voucher by e-mail or fax. A competitor, Parishuttle, offers rates of €16 to €25 in eight-passenger vans. Photo copyright © Paris Tourist Office. Photographer: Jacques Lebar.